Upon enrollment, users will receive notifications when Microsoft detects a "cyber incident" targeting an account - while the Redmond, WA tech giant already monitors Microsoft accounts for threats such as malware, phishing emails and suspicious logins. With AccountGuard, users will also receive "reactive remediation support through standard channel," and "prescriptive best-practice security guidance" to proactively prevent incidents, Bleeping reports. 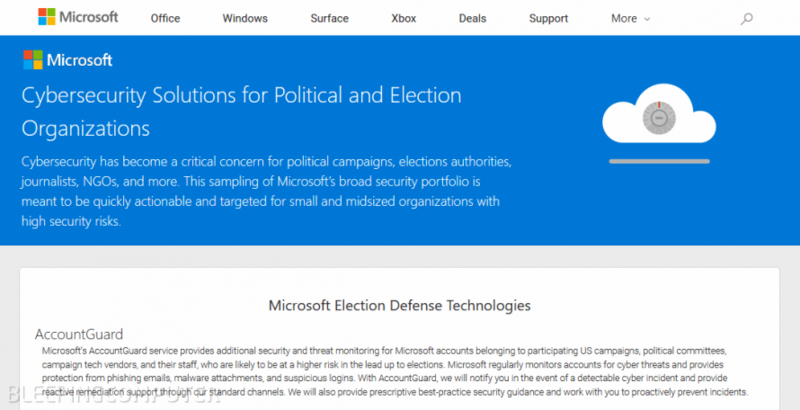 The new feature is part of Microsoft's "Defending Democracy Program," an initiative launched in April to safeguard the electoral process. The campaign aims to "Protect campaigns from hacking through increased cyber resilience measures, enhanced account monitoring and incident response capabilities," according to a Microsoft blog post. Microsoft hasn't made a formal announcement and the service is not yet indexed by any search engine.